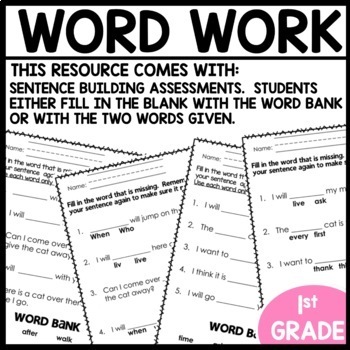 WORD WORK BUNDLE (UNITS 1 - 8) THE ENTIRE YEAR! This product has a set of weekly words (see below). 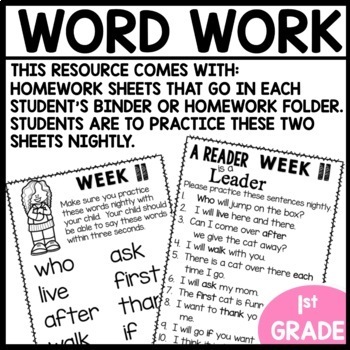 With these words, there are ★homework sheets ★center materials ★flashcards ★fluency strips ★center games and ★worksheets for extra practice and assessments. YOU CAN CHECK OUT MY BLOG POST HERE TO READ ABOUT THIS RESOURCE. HERE'S A FREEBIE FOR YOU TO CHECK OUT! 3. ABC order sheets This has two options for differentiation. One has ABC order only with the first letter and another has ABC order to the 2nd letter. 4. Home learning sentences and words (RF.1.3) These sheets are for home learning. One sheet has our words for the week and the other has sentences using the words. These go in the student’s binder and they practice at home for their assessment on Friday. 5. Word puzzle sheets Just another way for students to use our words for the week in a fun and engaging way. These are differentiated as well. 6. scrambled word sheets (RF.1.2.c and RF.1.2.d) There are two different types created for differentiation. 7. Scrabble tile count sheets With this sheet, students not only unscramble our words, they also have to use math and add up all the tiles. 8. Flashcards (copy, laminate, cut, and bind) (RF.1.2, RF.1.3) The flashcards have the word and the sentence for the students to practice. 9. Word Wall Words Just print on colored card stock to add to your theme. 10. Cut up sentence cards (two sets per week) (RF.1.4) These are our cut up sentences that students have to race to put together (they go with our home learning sentences). Students get into groups of two and race the other group to see who can build all the sentences the fastest. 11. 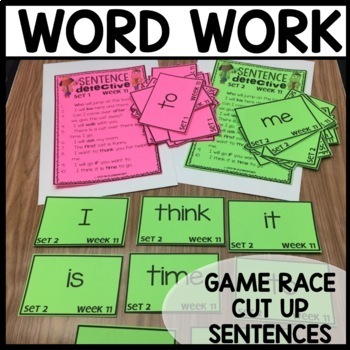 Cut, glue, and write sentences (RF.1.1, L.1.2.b) This can be used as an assessment or center work. 12. End of week word assessment13. Fluency strips of each sentence to help students work on fluency. 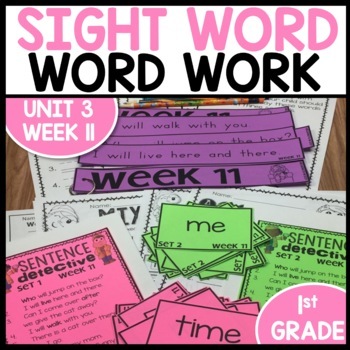 • WORD WORK BUNDLE (UNITS 1 - 8) THE ENTIRE YEAR!